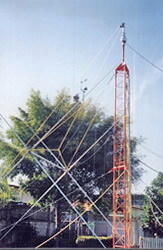 This shows the temporary mast at 9 meters (three sections). 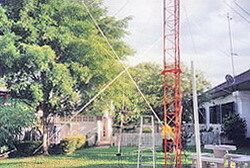 Whilst a jin pole was used to raise the antenna the picture shows the antenna being lowered. The hauling rope pulley is attached to the top of the rotator stub mast and the rope attached to the spider ends. Additional ropes one each end to stabilize the antenna and addition rope is requires to pull the antenna outwards to prevent snarling, minimum of four ropes are required. This is another pictures taken when the antenna is nearing the ground. For safety reasons and not wishing the quad arms to take the weight the antenna is lowered onto a pair of ladders. The spreader arms and loops are then a few feet off the ground. One of the riggers can be seen standing between the ladders and tower.